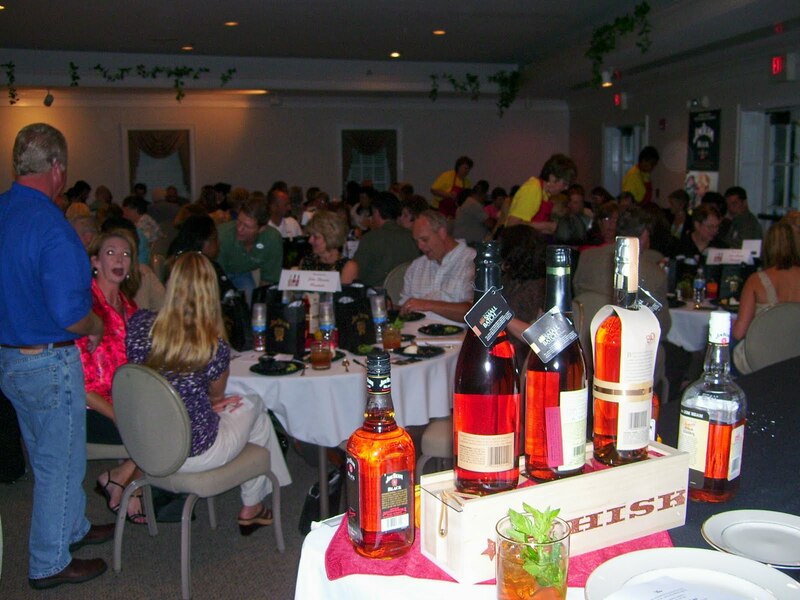 Bardstown Kentucky becomes the center of the bourbon universe next week when the 2010 Kentucky Bourbon Festival gets under way. More bourbon related events, featuring all the major distilleries, happen in just a few short days during the Bourbon Festival than any other time of year. 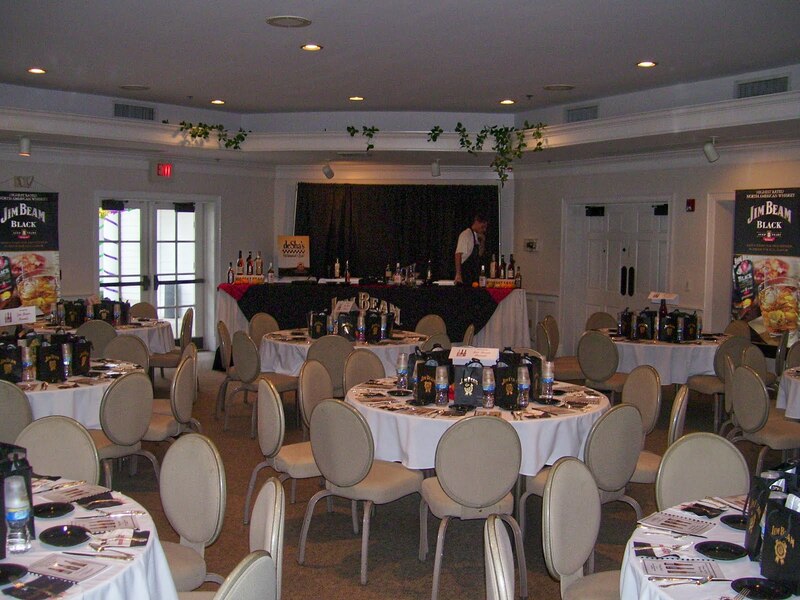 Jim Beam Global sponsors the Culinary Art: Bourbon-Style Cooking School every year, and every year it is the first event to sell out. 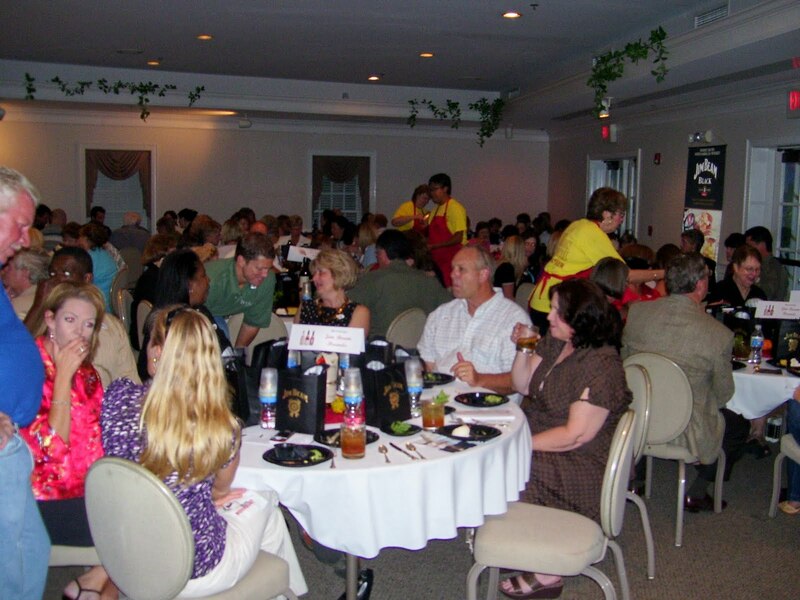 It’s popular and unusual because patrons pay for a five course meal prepared with Jim Beam Products. While they enjoy each course, a featured chef explains, cooks, and demonstrates how it is prepared. 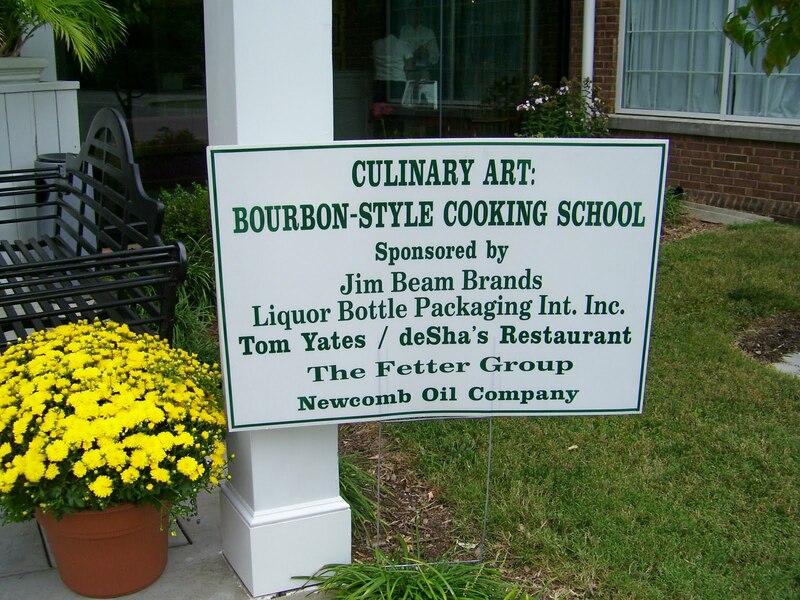 I have been fortunate to represent deSha’s Restaurant as the featured chef at The Bourbon-Style Cooking School for the past two years. It was an honor and privilege to be asked and to participate. It came with its challenges. The first year presented a huge learning curve. My Old Kentucky Home Park was gorgeous. The dining Hall and surrounding settings were lush, quiet, and beautiful. They had very limited kitchen facilities, which required us to build a mobile kitchen to prepare and serve a 5 course meal for 225 paying festival goers. Last year (2009) was a huge success and they invited us back for a third year. After much discussion and hesitation, we decided to step back for a year and allow others to enjoy the fun and exposure. Cooking with bourbon is very much like cooking with wine. Understanding the nuances and properties of bourbon and how they enhance the way food tastes is the most important ingredient for a successful meal. It took several months of planning, testing, and tasting various dishes and recipes before deciding on the final menu for last year’s cooking school. 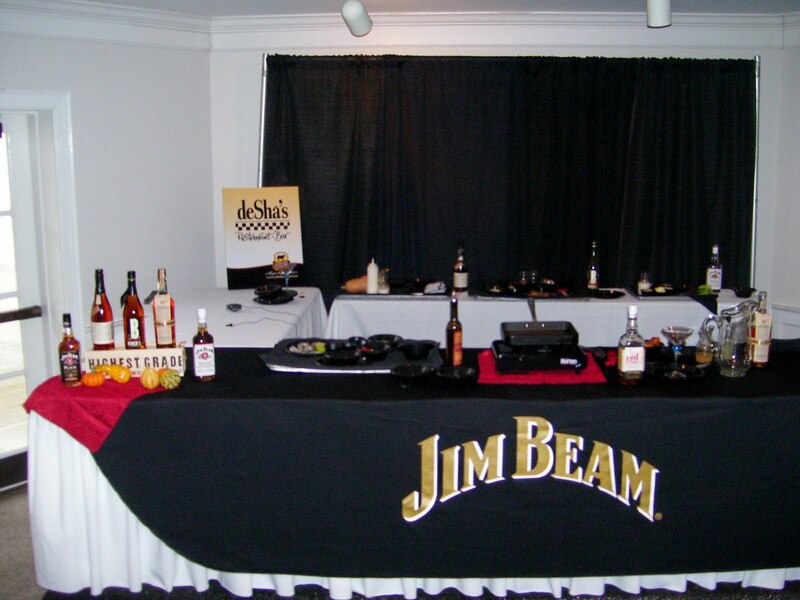 Working with Jim Beam products was fantastic. They all had very different characteristics, alcohol contents, and flavors. I used those characteristics to build a menu that would feature the bourbons and make delicious food. Because Jim Beam rolled out a new product last year, I featured it in an amuse bouche. We served our famous cornbread sliced thinly with Red Stag Honey Butter. Red Stag, a black cherry infused bourbon liquor, paired beautifully with the honey butter and cornbread. I played up the peppery honey citrus overtones of Basil Hayden in the appetizer course: Bourbon Margarita Shrimp Cocktail with Coriander Dusted Grilled Shrimp, Avocado, and Jalapenos. In the style of ceviche, I simply used a Basil Hayden Bourbon Margarita to marinate small poached shrimp, diced avocado, minced onions, fresh jalapenos, and scallions. We served it in shot glasses garnished with coriander-dusted grilled jumbo shrimp clipped to the glass and sweet potato chips on the side for crunch. The pepper and citrus bourbon overtones enhanced both the margarita and the shrimp. I called it a two-for-one apptetizer. They could eat the shrimp and shoot the margarita. For the first time at the Bourbon-Style Cooking School, I replaced the expected salad with Roasted Butternut Squash Soup with Booker’s Bourbon Creme Fraiche & Fried Sage. I flambed the bourbon, let it reduce to a syrup, mixed it with tart creme fraiche, and drizzled it over the soup. The smokiness of the bourbon brought earthy undertones to the bright creme fraiche and accented the unctuous roasted soup. I pulled out the big guns for the entree: Beef Bourbon-gnon: Baker’s Bourbon Braised Certified Angus Beef Short Ribs. It was a classic example of using bourbon like wine when cooking. I prepared the beef short ribs as Boeuf Bourguignon, replacing the red wine with Baker’s Bourbon. After thoroughly browning the ribs with mire poix and tomato paste, I deglazed the pan with bourbon, covered it with beef stock, and braised it for hours until fork tender. The silky caramel qualities of the bourbon reduced and concentrated to form a bold rich sauce that clung to the tender moist ribs. The most interesting bourbon experience was a happy surprise with the dessert course: Chocolate Bread Pudding with Jim Beam White Label German Chocolate Hard Sauce. When cooked with butter, sugar, and eggs, The Jim Beam White Label morphed into an intense caramel flavor, creating a german chocolate caramel hard sauce. It was over the top and rich. The perfect ending to a decadent bourbon culinary evening. I’ll miss not being there next week. I’ll miss the chaos in the kitchen, the thrill of demonstration cooking, the wonderful receptive diners, the gracious hosts, and the eager volunteers. What will I miss most? Gathering my thoughts and nerves right before service while sitting under shaded trees listenening to church bells chime My Old Kentucky Home throughout the rolling grounds of My Old Kentucky Home State Park. [advertisement] This Ace Daily Blog is sponsored by Town and Country Bank and Trust Co. Local experience, award-winning customer service, and community-minded for over 100 years. Next articleGo Big Blue! Who is a UK Cheerleader?